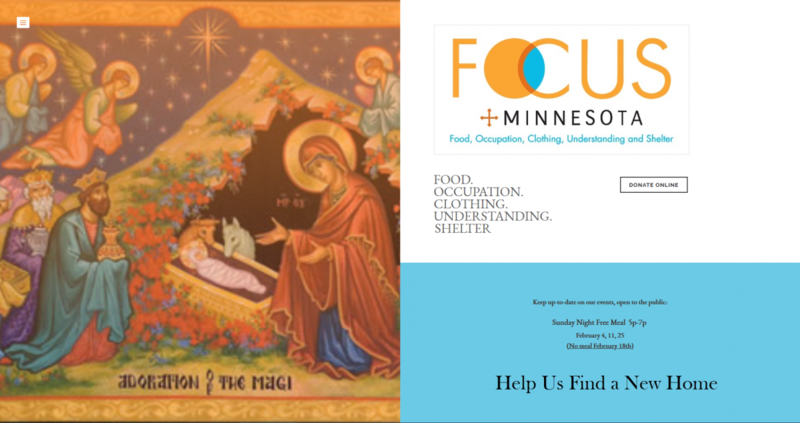 FOCUS Minnesota is a non-profit organization I have personally worked with on a number of occasions over the years. My family and I have volunteered here to help cook, feed and eat with homeless & struggling people around the Twin Cities area. It’s not a typical soup kitchen with people going through a serve-line. Here we actually seat guests as you would at a restaurant and then we bring them their meal at the table. We walk around to refill drinks and/or clear tables. We listen. Additionally, the organization provides pantry goods to those who have a place to lay their heads and cook their own food but are struggling. They also provide clothing to those in need, resources, and of course, prayer. But, the memories I hold most dear is the time I was able to spend to get to know the people of our communities who often feel forgotten. When ‘guests’ would come for Sunday dinners with FOCUS, they were greeted as family… and many of them visiting had family; young children. So, there was an area where these children could read books and relax as children for a short time. We would sit and eat with this community of people… talk with them… hold their hands, and listen, even find the occasional smiles and bits of unhindered laughter in otherwise desperate souls. It was, and still is, a way of letting them know THEY MATTER; they’re NOT INVISIBLE; and THEY ARE LOVED. It was a HUGE blow to us to find out the space we had been leasing has been sold and we have less than 15 days to move now. FOCUS Minnesota was located in prime area of need in Minneapolis; with great foot traffic, and had become a community cornerstone. We were all very saddened at the news this weekend, but this forced movement will be a bigger blow to those we served in the community. We now need help getting the word out about the immediate and urgent need to find a new home for the organization. You can learn more about the organization here http://focusmn.weebly.com/. Please, keep your eyes and ears open for a small commercial property with a kitchen space as well as space for storage of clothing, household goods and dry goods; either for sale or lease, in a depressed area and preferably in/around Minneapolis. If you or anyone of your great connections knows of a single-level space FOCUS can use please let Matuska Vera Proctor know how you might be able to help or put her in touch with those who can.